Plymouth Argyle boss Derek Adams admitted this week that he was unsure about what to expect at Mansfield Town in Saturday’s FA Cup first round tie. The in-form Pilgrims are unbeaten in 13 League Two games, including a 2-0 victory at Home Park against the Stags, while Mansfield have won just two matches at the One Call Stadium this season but were unbeaten in six games before last Saturday’s gome defeat to Stevenage. 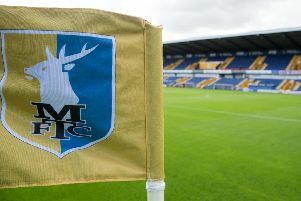 Adams, who has led Argyle to the top of the table and an 11-point cushion in the top three, said it was that inconsistency at the Stags — and the well-publicised comments by Mansfield manager Adam Murray this week — that had left him uncertain. “We’re unsure about how Mansfield might go because Adam Murray has spoken about their home form,” Adams told the club’s official website. “One thing is for sure — they are going to be direct and we are going to have to deal with a lot of high balls into the box because they have got a very good physical element to their team. “They have changed their style a wee bit this year — they have got a lot of six-foot-plus players in their team. Adams has rotated his squad for cup games this season as Argyle recovered from losing their first three matches to surge up the table. And he said that he might do so again on Saturday, while pointing out the importance of winning the first round tie and possibly making the third round and the chance to play a top flight side. “We will have a look at things,” he said. “We might keep with the same team, we might change. “We always want to win the next game. The FA Cup is an important competition, and we would like to progress to the next round. It can bring a lucrative tie – maybe a Premier League team to Home Park in round three. “Mansfield is a difficult venue to go to — we found that out when we went there and drew 0-0 last season.